Highfield Hotel offers budget 1.5 star accommodation. Please note that all rooms have shared bathroom facilities. Conveniently, Highfield Hotel is located in the heart of the city, close to transport and all attractions. 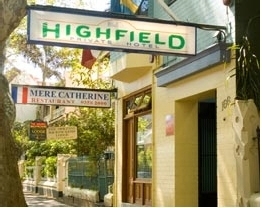 Located in Potts Point, Highfield Hotel is well situated to meet the many needs of tourists. Highfield Hotel has 32 rooms comfortably furnished, spacious and famous for its cleanliness. We ensure you can enjoy a restful night's sleep. On request, we provide you with hair dryer, iron and ironing board and crockery/cutlery. There is a common room which includes tea and coffee making facilities, toaster, fridge, internet access, microwave, remote control colour TV. Our receptionist will be glad to assist with advising on how to get around Sydney and where to find local attractions. Our friendly staff will be able to assist you with tour bookings. Rooms range from double, twin, single, family and large family rooms. An extra bed is available at a small additional charge. All rooms are non smoking rooms. All rooms have Colour Television for your convinience. A self-served breakfasts are available daily from 800to 10.00am. Takeaway meals can be delivered to your hotel room. Please ask Reception for a variety of menus. Shared bathroom facilites. Rates are for 2 people. Maximum occupancy is 2. Bedding configuration is a double bed. Free wireless broadband internet, refrigerator, TV, shared bathroom and kitchen, free basic breakfast serves from 8-10am. Ironing equipment, DVD Player and Hairdryer available at reception by request. Shared bathroom facilities. Rates are for 2 people. Maximum occupancy is 2. Bedding configuration is a double bed. 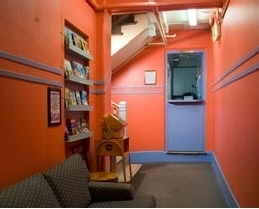 Free wireless broadband internet, refrigerator, TV, shared bathroom and kitchen, free basic breakfast serves from 8-10am. Ironing equipment, DVD Player and Hairdryer available at reception by request. Shared bathroom facilities. Rates are for 2 people. Maximum occupancy is 2. Bedding configuration is a double bed. Free wireless broadband internet, refrigerator, TV, shared bathroom and kitchen facilities, free basic breakfast serves from 8-10am. Ironing equipment, DVD Player and Hairdryer available at reception by request. Shared bathroom facilites. Rates are for 1 people. Maximum occupancy is 1. Bedding configuration is a single bed. Free wireless broadband internet, refrigerator, TV, shared bathroom and kitchen facilities, free basic breakfast serves from 8-10am. Ironing equipment, DVD Player and Hairdryer available at reception by request. We offer free wireless broadband internet access throughout all rooms. Check in time is up to 10pm. We are happy to greet you any time. Should you require a later check out time, please discuss this with reception on arrival. Please indicate time of arrival. Off-site parking is available at the Kings Cross Car Park for $25 for 24 hours by asking a prepaid ticket to reception, which is approximately 10 minutes walk away. Street parking is a possibility if you can find a spot (and it may or may not be metered depending on the area and time of day). From the city proceed down William Street heading towards Double Bay. Turn left at the big Coca-Cola sign. Turn left into Darlinghurst Road and then immediately turn left again into Victoria Street. We are 11kms from the Airport. There is an Airport Bus which will cost $12 and delivers you to the door. A taxi fare is approximately $30-$35. Alternatively take the train to Kings Cross Station. We are 100 metres from the train station. The train from Kings Cross station goes to the city circle. From the City, it is a 5 - 10 minute walk to Cockle Bay and 25 minutes to Darling Harbour arriving at Imax Theatre, Chinese Gardens, the Entertainment Centre and Chinatown, Sydney Aquarium, Cockle Bay cafes/restaurants/night clubs, Darling Harbour shopping and Exhibition Complex, Star City Casino, Maritime Museum and Powerhouse Museum. We are a 20 minute walk via William Street arriving at Town Hall, Queen Victoria Building, George Street Cinemas, Pitt Street Mall (shopping), AMP Tower, St Andrews Cathedral, St Marys Cathedral and Australian Museum. It is a 25 minute walk through the beautiful Botanical Gardens (Harbour Views) arriving at the Opera House, The Rocks (Old Sydney), Museum of Contemporary Art, Sydney Observatory, Harbour Bridge and Circular Quay (main ferry station).